Perhaps its most lasting legacy is that it changed the role of females in entertainment. At a time when society demanded women dress in Victorian style full-length dresses—burlesque challenged that style—and, in later periods, may have influenced the movies. The word burlesque has been used to describe a theatrical genre over a two hundred year period and from the early 1800’s to the 1940’s, the problem, is that genre evolved during that period and most people apply the term to that type of theatre at the end of the period. In fact, the productions were ribald almost from the start, but in the beginning the ribald was less flamboyant then the later period. 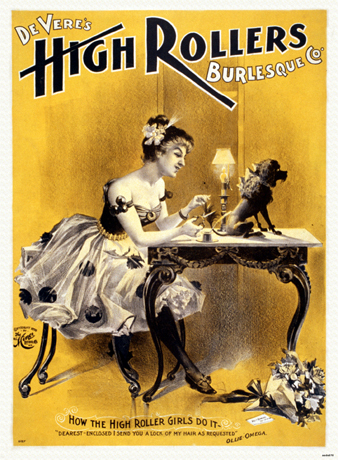 Burlesque theatre ridiculed the serious and, less often, made the ridiculous serious. As it evolved, it became an entertainment for lower and middle class audiences. What packed the houses were the sights of women in flesh covered tights sandwiched between comedy and music. Over time the shows became more and more risqué resulting in reform mayors (including New York’s LaGuardia) demanding the police raid the theatres presenting them. Such a raid is the subject of the movie The Night They Raided Minsky’s. As radio and television developed many of the performers who did comedy in the burlesque houses became radio and television stars. Included among these were future musical comedy stars Jackie Gleason, Fanny Brice, Bert Lahr, W.C. Fields, Red Skelton, Phil Silvers, and Bob Hope. Would Busby Berkley and even Ester Williams ever been possible without the groundbreaking burlesque troupes? For better or worse, burlesque left a lasting impression on the theatre.